SFTP preloading is one of the methods we employ to seed your backup data to an Axcient data center. SFTP lets you take advantage of a faster internet connection somewhere other than your customers site by creating a preload dataset on to your disk, then taking the disk offsite to be uploaded directly to an Axcient data center via SFTP. 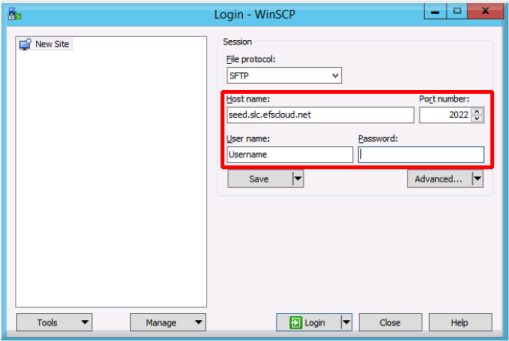 In order to use SFTP, you’ll need to be provisioned with an SFTP account to an Axcient data center. We will create your account and email you instructions for the next steps to take. Once you have an SFTP account with us, you may upload preload datasets whenever you like, then Create a new support ticket when they are ready for processing. Why use SFTP instead of Axcient's Round-Trip Preloading Service? SFTP has the potential to be faster than waiting on drive shipments, depending on the amount of data and the speed of your internet connection used for the upload. SFTP can be more secure than shipping a regular preload drive. Your data is uploaded directly to our data center and doesn’t have to be physically transported. SFTP can be more reliable since hard drives are prone to unexpected failure when shipped. How does SFTP preloading work? SFTP is a protocol that enables files to be transferred between hosts using a secure connection. Axcient provides you with an SFTP account and a private directory in our cloud. Data is uploaded securely using your favorite SFTP client. Once the upload has finished, contact Axcient and the data will be consumed into our cloud. How long does an SFTP upload take? Run the SFTP client and transfer from a computer with a modern CPU that has a minimal processing load. This will ensure CPU overhead for encryption doesn’t bottleneck the transfer. Use an SFTP client that has connection buffer optimization (dynamic buffering). We recommend WinSCP, which can be optimized using the settings in this guide. Create a new support ticket requesting an SFTP account. You will only need to do this once. We will send you a confirmation email containing your new SFTP account user name, private .ppk key file, and a URL to retrieve your passphrase. NOTE: Your passphrase URL can only be accessed once, so please save your passphrase securely. 2. Create a preload dataset using your own hard drive. We recommend directly-attached SATA or USB 3.0 drives. 5. 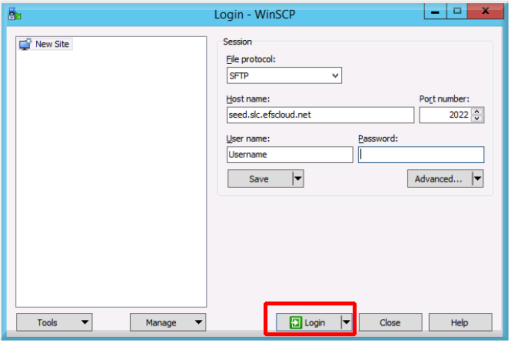 Run the SFTP client, Then, connect to Axcient's SFTP server and enter the following details. 6. WinSCP will prompt you for a passphrase associated with your key. Use the URL we sent you in the confirmation email to retrieve your passphrase. 7. Connect your drive, and upload the entire structure of your prepared preload to your staging area. 8. Contact us for processing. When your upload has finished, let us know by Creating a new support ticket so we can process your dataset. Once completed, your data will be removed from the staging area. NOTE: We will remove data from your SFTP staging folder if it is older than 30 days. Please make sure that you only upload data that is intended for a preload, and that you contact us immediately once your data is ready to be processed. "SFTP isn’t for me. How do I request a preload hard drive for seeding, instead?"